great balls of peanut butter! You know when you get sick and you feel awful and then when you’re well again it’s completely amazeballs awesome? That’s me times a million. I get that same feeling of elation as I would every time I came out of a chemo round. It makes me want to burst through the front door and go running into the mountains. Because I was sick for most of last week, I decided to lay low over the holiday, listen to my body and rest. I do get a little stir crazy after a few days indoors, but managed to find several projects to keep me occupied. And it helped to just stay off the computer. 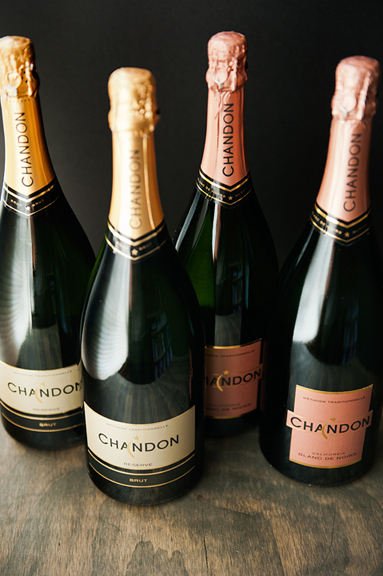 We had received a club shipment of sparkling wine the week prior – four magnums. I was on the mend, so we decided to have some folks over to help us put a dent in the bubbles over the weekend. I mean, magnums are so festive, no? I was psyched to be able to cook for friends or do anything for that matter! 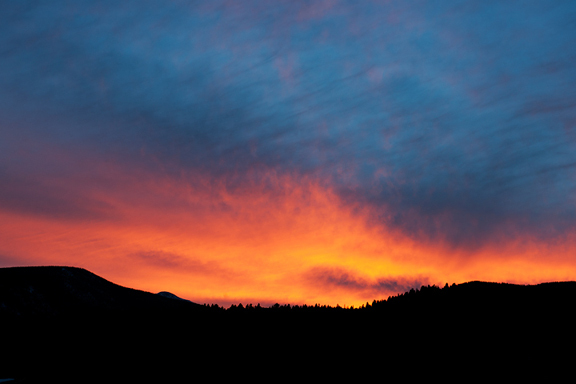 We were treated to a blazing sunset off the deck and an evening spent with wonderful people. I’m feeling good and ready to plunge into January! Jeremy and I walked off the party food Sunday afternoon. It had been a week since I’d been outside in the woods or even remotely active and I missed it. It’s my battery charger to get out and breathe that clean air, to walk through the pristine snow. And now that I’m nearly back to normal, I can look at the computer monitor without getting a headache. In the baking madness of mid December, I dug up an old recipe my elementary school teacher had made for my class back in the 70s. 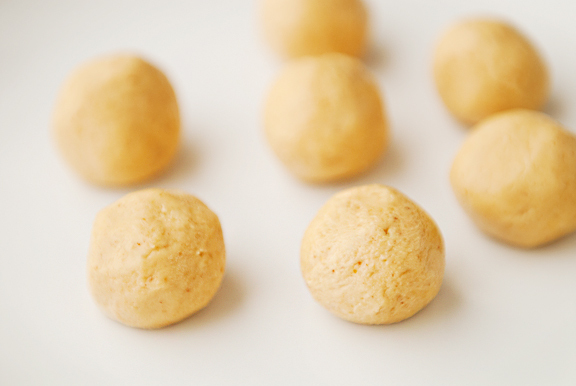 They’re called peanut butter truffles, but I always thought of them as peanut butter balls. It called for margarine in the filling and paraffin wax in the coating, so I made the appropriate adjustments. That’s right, I subbed butter for the margarine (we don’t use margarine on this blog, EVER) and omitted the paraffin wax altogether. It’s a simple treat to make, which is probably why my teacher thought it would be a good project for her class of second graders. I just remember bringing home a small canister filled with cupcake papers that had three peanut butter balls in each paper and wanting to show my grandma what we had made that day in school. I haven’t made these in a long long time. I used organic ingredients where possible and mixed the filling in no time with my stand mixer. I considered skipping the butterscotch chips and just tempering dark chocolate for the coating, but there was that whole nostalgia thing going on in my head. So the butterscotch chips stayed. But if you are interested in tempering chocolate for a coating, I describe the seed method in this post. 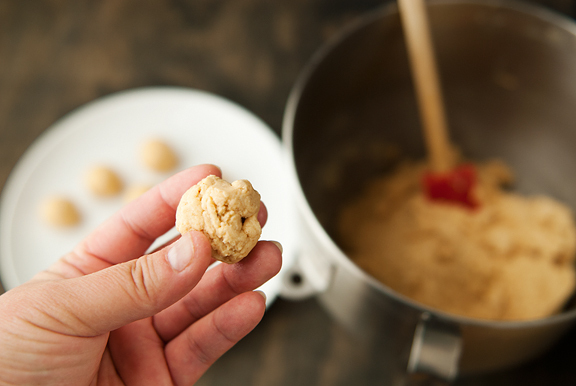 If the working temperature in your place is too warm, you may want to pop the rolled peanut butter balls into the refrigerator or freezer to keep cool and to hold their shape. You definitely don’t want them to get soft while you dip them in the coating or else things will end badly. 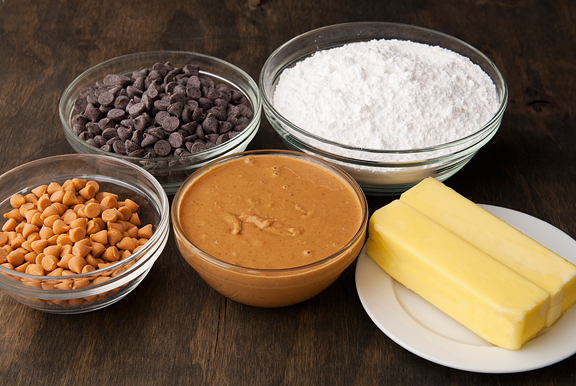 Melt the coating on low power in the microwave or in a double boiler until just melted to avoid burning. The warmer the melted chocolate and butterscotch chips, the thinner your coat will be. I let my coating cool to about 98°F before I began dipping. You can dip by hand, with a fork, using toothpicks, or candy-making tools if you have them. Just work quickly and shake off any excess before setting the truffles on a silpat, parchment, or wax paper to cool. The peanut butter truffles are as I remember them, but I suppose my tastes have changed because I found them to be pretty sweet. Everyone else who has tried them loves them, especially Jeremy who is not a fan of peanut butter. That was a surprise! The nice thing about homemade cookies and candies and individual goodies is that they are a small gift that can bring big smiles to people’s faces. 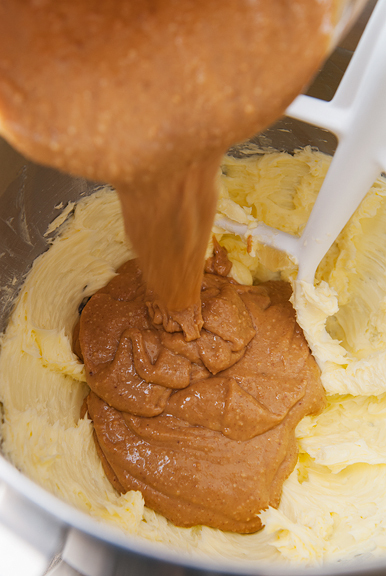 Cream the butter and peanut butter together in the bowl of a stand mixer fitted with the paddle attachment. 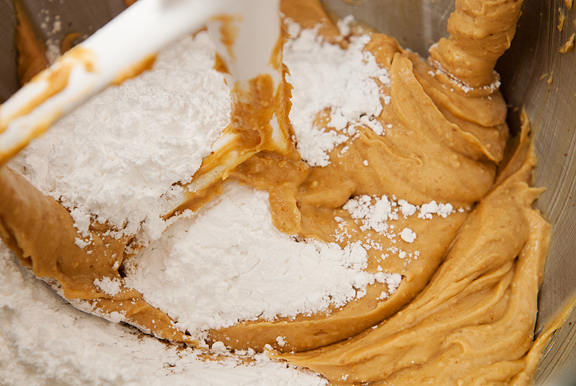 When the butters are blended, gradually add the confectioner’s sugar and mix until incorporated. 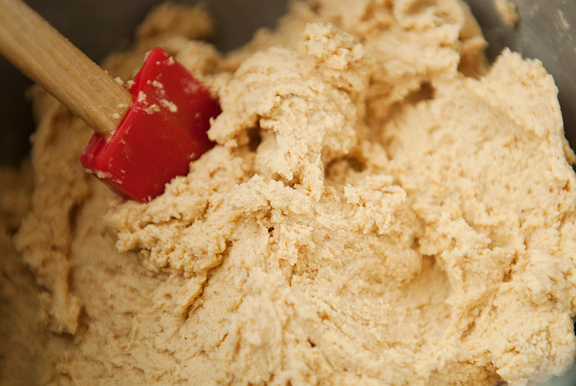 Continue until all of the sugar is blended into the butters and the filling is a fluffy, but not sticky, dough. Start pinching off about a tablespoon or more of the filling and quickly rolling it into a ball about 1 inch in diameter. Don’t work it too much or the heat from your hands will start to melt it. Place all of the rolled balls in the freezer. 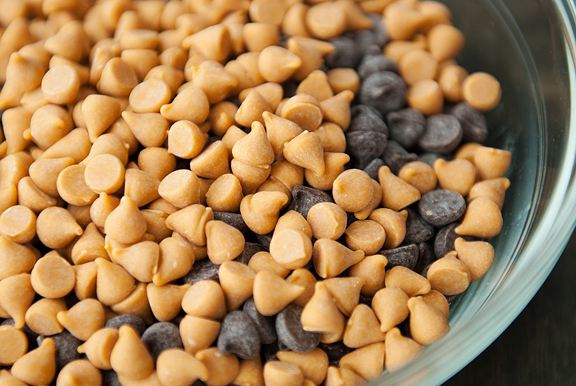 Melt the chocolate and the butterscotch chips together in a double boiler or on low power in a microwave (stirring every minute or so to avoid burning). 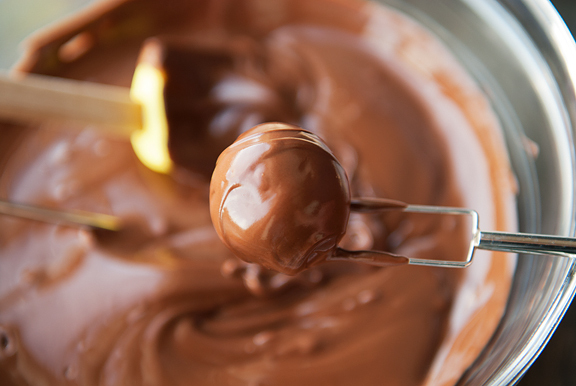 When the chips are mostly melted, remove the melted chocolate mixture from heat and stir until smooth. 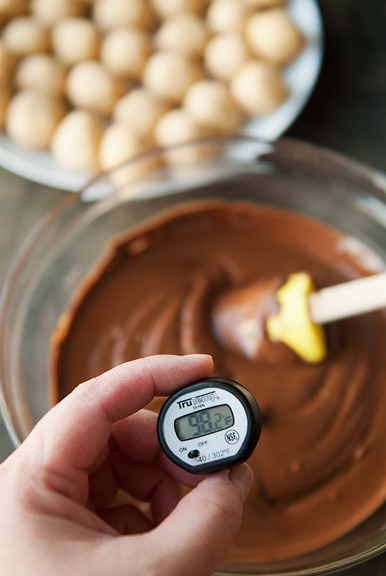 Measure the temperature and start dipping when the coating drops below 100°F. [Alternatively, you can temper semi-sweet chocolate if you know how to do that.] 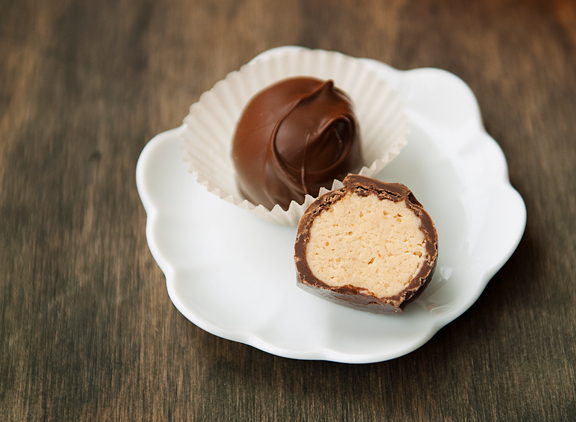 Drop a cold peanut butter ball into the coating and roll it around until it is completely covered with chocolate. Lift the ball out with your hands, a fork, a toothpick, or a candying dipping fork; drain off the excess coating, and then gently roll it onto a silpat, parchment-lined baking sheet, or wax paper-lined baking sheet to cool. Repeat. 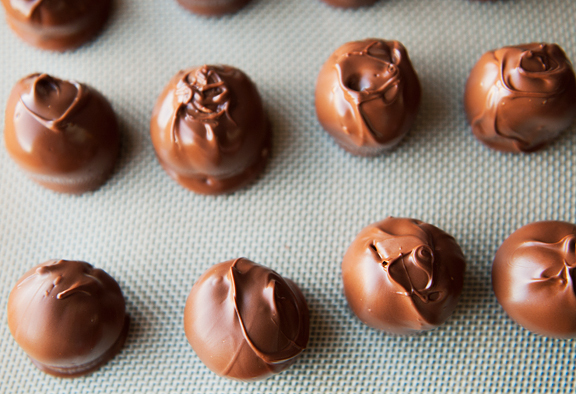 Let the coating dry completely before attempting to remove the peanut butter truffles from the cooling surface. Store in an airtight container in the refrigerator or a cool, dry location. Makes about 5 dozen. Glad you’re feeling better & are out & about & cooking. Happy New Year! Happy New Year!!! Thank you for your blog. I’m very excited to make these! Wishing you, Jeremy, and Kaweah a very happy new year, Jen! I love that you still have a recipe from your second grade teacher. Happy New Year! So sorry to hear that you were sick last week, but I’m glad that you’re feeling better. 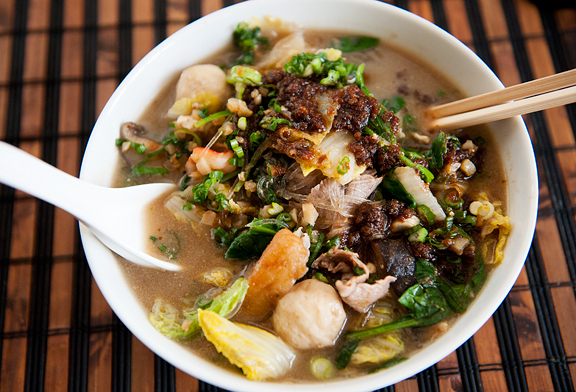 First off, that Chinese noodle soup looks rockin! And, of course, the truffles look delicious as well. 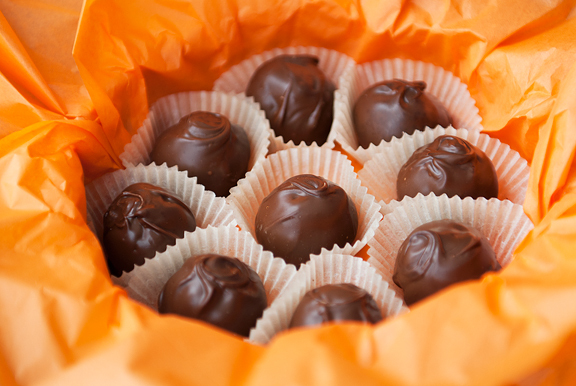 Your truffles look like they were purchased from an expensive chocolate store. They look so tempting. Happy Neww Year to the House of Butter! See you in 2013! those truffles look delicious! Happy New Year to you, Jeremy and Kaweah! Happy New Year, Dear. I love Reese peanut butter cups, but don’t get them very often. But your peanut butter truffles are so delicious. Now, may I have a batch of these treats?!! These look beautiful! And not only is a bowl of chinese noodle soup good for being sick, but it’s a great way to say good bye to 2012! Thanks for sharing. They look so yummy, I may try them. I might substitute some extra dark chocolate chips to take some of the “sweet” out of them, but otherwise ………yummmm. Happy New Year to you, Jeremy and Kaweah! Jen, those look so yummy!! So glad you are feeling better! Here in Ventura, CA we’ve had some amazing sunsets too. Happy and healthy 2013 to you, Jeremy & Kaweah! Where I come from (Ohio) these are called “Buckeyes” and are the state candy. They are a staple in any Christmas cookie platter, bake sale or birthday party. The only difference is that they aren’t dipped completely in the chocolate but a little circle of peanut butter is left exposed so it really does resemble a buckeye. Another variation that I personally love is that some people add rice crispies to the peanut batter. It gives it a little crunch and breaks up the richness. Happy new year! I hope you thought to save one of those bottles for last night. Couldya post the recipe for that soup? It looks great. I know that should probably be ‘yummy’, but I refuse to use that word. Happy New Year to you and yours. So glad you are feeling better. The good doctor has it too…for the second time this season (hence they say it will be a lighter case)…somebody needs to carry hand sanitizer! I think the soup is the perfect fix. Peace and Prosperity to you in 2013! Your writing, photography, and joy of life are all so beautiful! I love it! Peanut Butter Balls are a weakness of mine. Particularly when paired with a really good bottle of red wine. Hope you’re feeling better! Happy 2013! I hope you are better, I keep my eyes on youre site since I see it in the first place. Please have a wonderful new year, Kaweah, Jeremy, not mention about me and my black dog need you. Be with us in 2013 and have all the good thoughts from us. I love this food blog! You write so well, you cook so well, you photograph so beautifully. We readers are lucky! These “truffles” are a taste memory from my childhood, also. Thanks for reminding me of them, sans wax and margarine :) I hope you enjoyed the bubbly! The NYE party we attended offered magnum bottles, as well… we made quick work of them. These look so tasty! I may make them for a friend who just had a baby. I am bringing her a meal tomorrow and these look like a perfect little after dinner treat. Thanks for sharing and glad to hear you’re feeling better. The truffles are BEE YOU TIFUL!!! 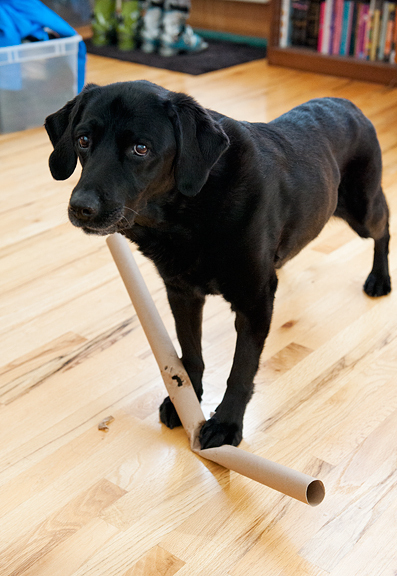 I’ve been fostering puppies for the Longmont Humane Society and they, too, LOVE paper roll tubes. What a great toy for them and sweet little Kaweah looks like she’s enjoying them! She’s a sweetie! Kristin – thank you! Happy New Year! Nicole – I hope you liked them! Ali – you’re so sweet, thank you! Tanya – happy new year to you! spicytofu – :) Thank you! Linda – I think I would prefer a pure dark chocolate coating too. Denise – thank you and Happy new year! Jill – thank you, my friend. I’m so sorry Dr. H was sick :( Hope we’ll see you both in 2013! Shut Up and Cook – thank you and happy new year! Sophie – sounds like you guys had more fun than we did :) Happy new year! Melanie – yay, puppies! Thank you and happy new year, my dear! I’m late to the game, those pb truffles look wonderful. I did 3 kinds myself this year. Amaretto, Chubby Hubby and Mint Cookie truffles, along with a bunch of other homemade candies. Happy New Year! When I am feeling a little under the weather, I love to treat myself to a big bowl of pho. So comforting. I would kill for a bowl that soup right now! How funny — an elementary teacher made some of these and gave them to me yesterday. I’m aching to try to make them myself — fabulous! God bless you and heal you! I’ve been mixing for a long time and they just aren’t losing their stickiness. Should I add a bit more powdered sugar? Maybe a tsp. at a time?